Everyone stresses out SO much about what to wear… and I want to try and take some of that stress out of this! This is supposed to be fun, right?! Start with choosing your colors: There are these great little things called “color palettes.” Usually they are used for home decorating and fashion design... but there're also perfect for coordinating colors for a family portrait. I suggest that you choose 1-2 neutral colors for your base (think beige, gray, white etc) and then add 1-2 complementary colors. This is where the color palettes come in. It really makes coordinating groups a lot easier and does all the work for you! Pinterest.com is a great place to start looking. Here are a few (below) that I suggest for the spring/summer season, especially great for beach portraits! 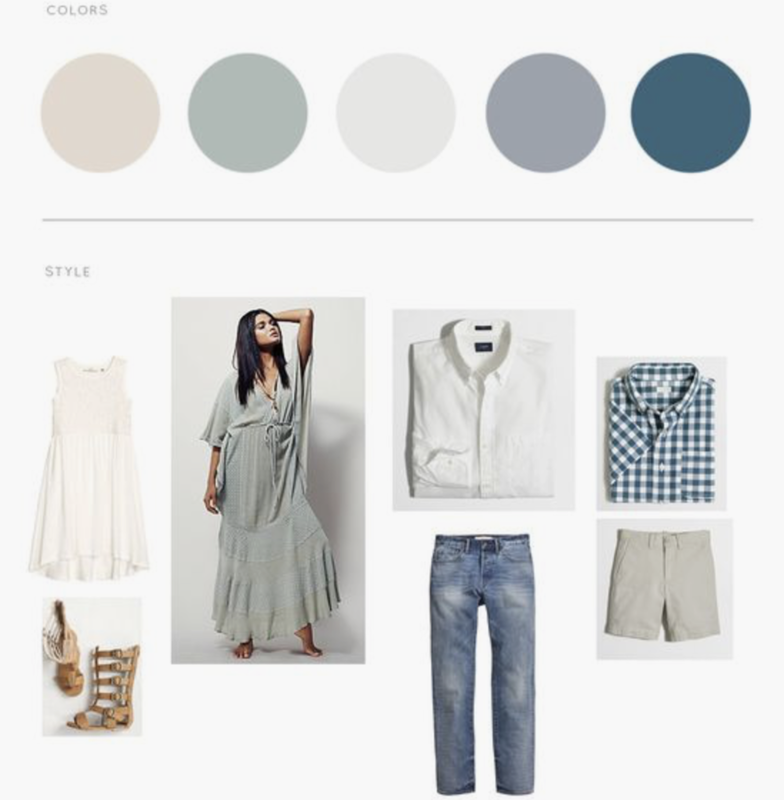 Another idea is to draw colors from your location and incorporate them into your wardrobe. If you're location is the beach, choose a light beige as your base neutral and blues and teals as your color. You can also choose colors that compliment your location. Look at the color wheel! If your backdrop has a lot of cyan, find a way to incorporate some magenta details to contrast your backdrop. Is your backdrop bright and clean like the beach or snow? Try something that will POP like bold (but not neon...) colors. - Shoes matter! Don't have someone in dress shoes while some else has sandals on. - Accessories matter! Add scarfs, hats etc to add the coordinating color to an otherwise neutral outfit. - Avoid being overly matchy-matchy, ideally everyone should have some variations in their colors. - I usually like to have kids in the brightest colors to pop more within the group since they're the smallest, but this isn't a must. - No text/logos on clothing, please! - Make sure you don't put everyone in jeans. Mix it up, texture and color. Maybe girls in skirts and boys in chinos while dad wears jeans etc. - No hair cuts within 2 weeks before the shoot! - If you have very little kids, bring an backup outfit in case the first one gets soiled!